Review by AllTheBestFights.com: 2016-09-10, exciting fight with some beautiful combinations and tough exchanges: Gennady Golovkin vs Kell Brook is one of the best boxing fights of 2016 and it gets four stars! Both undefeated, the Wbc, Wba, Ibf and Ibo champion Gennady Golovkin entered this fight with a perfect boxing record of 35-0-0 (32 KOs=91%) and he is ranked as the No.1 middleweight in the world while his opponent, the Ibf Ww champion Kell Brook, has an official record of 36-0-0 (25 knockouts) and he entered as the No.3 welterweight but in this bout he moved up in weight class to the middleweight. In their last three fights Golovkin beat Willie Monroe Jr (=Golovkin vs Monroe Jr), David Lemieux (=Golovkin vs Lemieux) and Dominic Wade (=Golovkin vs Wade) while Brook has won over Ionut Dan Ion (=Brook vs Ion), Frankie Gavin (=Brook vs Gavin) and Kevin Bizier (=Brook vs Bizier). 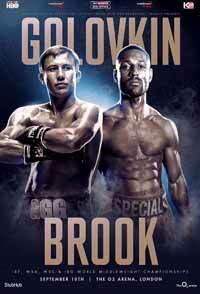 ‘GGG’ Golovkin vs Brook is valid for the WBC, IBF, IBO, World middleweight titles (all held by Golovkin). Watch the video and rate this fight!